Once upon a time, Jo Ellen, the Hoosier Gardener, came to see my garden and asked me why I had “caged” my Clematis integrifolia ‘Alba’. She suggested I free it and let it just grow up and around the plants near it. I decided she might be right, so I wrote a post about it and then proceeded to set it free. Writing that post got me thinking about Clematis and how I especially love those with bell-shaped flowers, and how I had accidently weeded out my tiny Clematis integrifolia ‘Rooguchi’ last summer (pictured here before I carelessly weeded it out). Don’t you just hate that sick feeling you get when you are weeding and suddenly realize you weeded out a plant that wasn’t a weed? Even though my irresponsible, over zealous weeding led to the demise of 'Rooguchi', I decided I should buy a new one. I inquired online to find a good source of Clematis and Dee of Red Dirt Ramblings and Mr. McGregor's Daughter both replied without hesitation “Silver Star Vinery”. Late one night, I proceeded to check out Silver Star Vinery’s website and found not only ‘Rooguchi’, but also two other Clematis vines to purchase. I placed an order for those three Clematis and was pleasantly surprised that the confirmation email was not an automated reply but an actual real person writing to me. She wanted to make sure the plants would arrive when I could plant them. I replied back to confirm the shipping date and included my blog url in my signature line. Long story longer, Debbie, the star of Silver Star Vinery, replied back that she had read my post about freeing the clematis and she would love a division of my ‘Alba’. 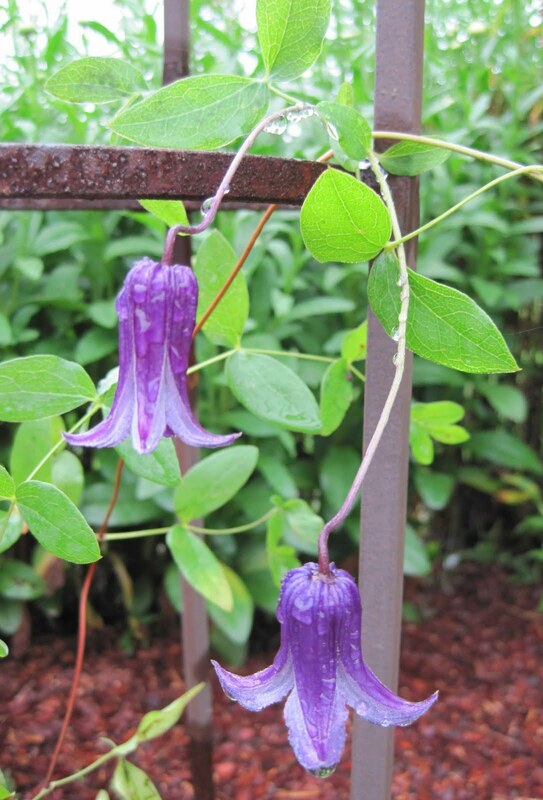 She made me a good offer, which included a seedling of one of her “integs” as she called the shrub-type Clematis. I agreed. My new Clematis arrived Thursday afternoon - the three I ordered plus a seedling called ‘Debbie’s Integrifolia’. It should have blue bell shaped flowers. All are now safely planted in my garden. On Monday, I'll "fork off" a nice division of 'Alba' and send it back to Debbie. And that is how I ended up with four new Clematis in my garden this spring. Let others see your garden and ask you those “why” questions that make you think and see your garden differently. It may trigger a chain of events that leads to more new plants and other changes “for the good” in your garden. I'd love to see a post of what your freed Alba clematis looks like. Does it sprawl, climb up over other things... how does it look? I have Alba going up a trellis as I want the vertical accent. But I wonder how it would look if I let it sprawl. Hmmm. I planted a clematis last Sunday and have not tied it to the round iron trellis I planted it in. I'm going to see what it does from there. I got a Jackmanii. Debbie is a really nice person. I've bought many clematis from her. One was mis-labeled as Claire de Lune and ended up being H.F. Young. I could tell until a year or so later, and she offered without my asking to replace it for me. I actually told her no thanks because I like H.F. Young a lot. Those clematis blooms are just so sweet-I love clematis, such a romantic flowering vine. This is really a lovely clematis. I wish I had more room for more clematis, if I did this would be one I'd consider. Oh yes, weeding out a plant accidentally. I have done that, and the sinking feeling in the pit of your stomach is really something. It doesn't help that the garden fairies are generally rolling around in the next bed in completely abandoned amusement at your plight. . .